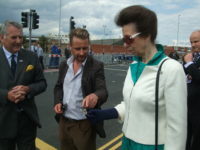 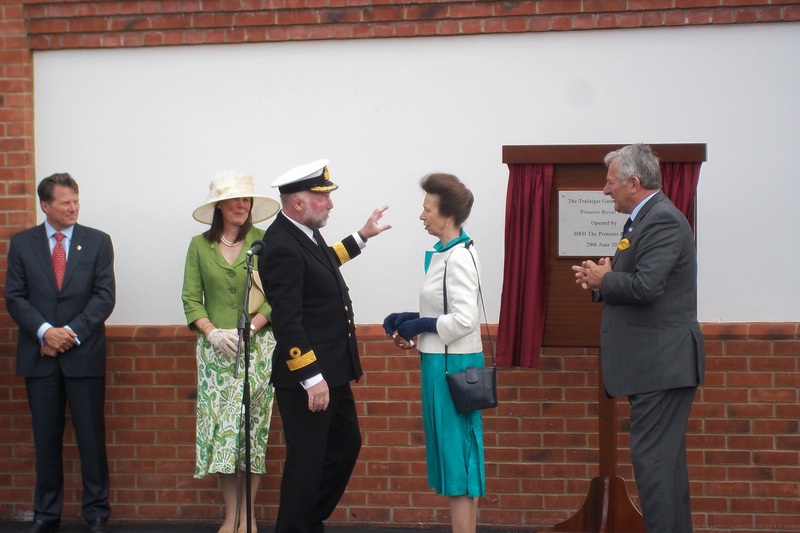 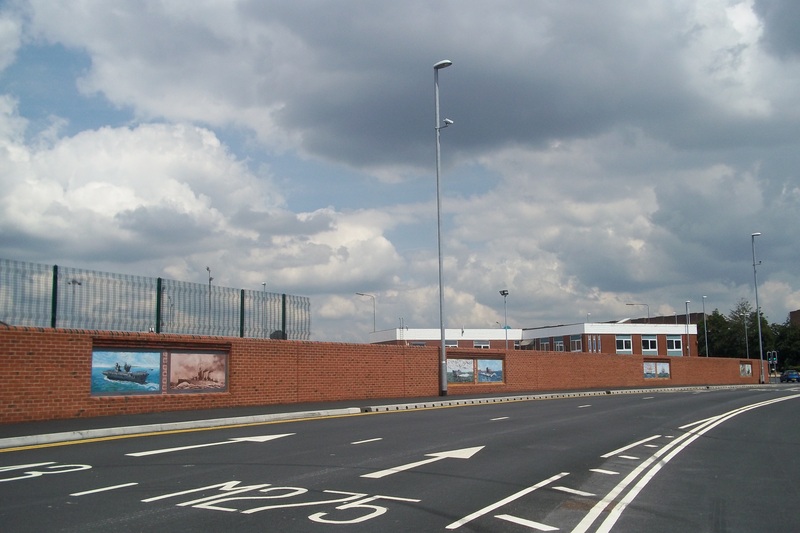 Trafalgar Gate Link Road (TGLR) now called Princess Royal Way was a new multi-million-pound development at the end of the M275 motorway coming into the city to access the Naval base easier for heavy traffic. 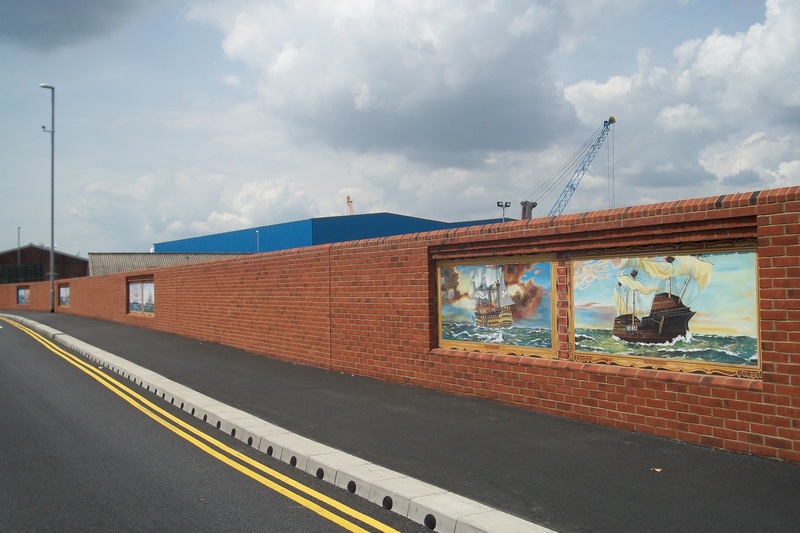 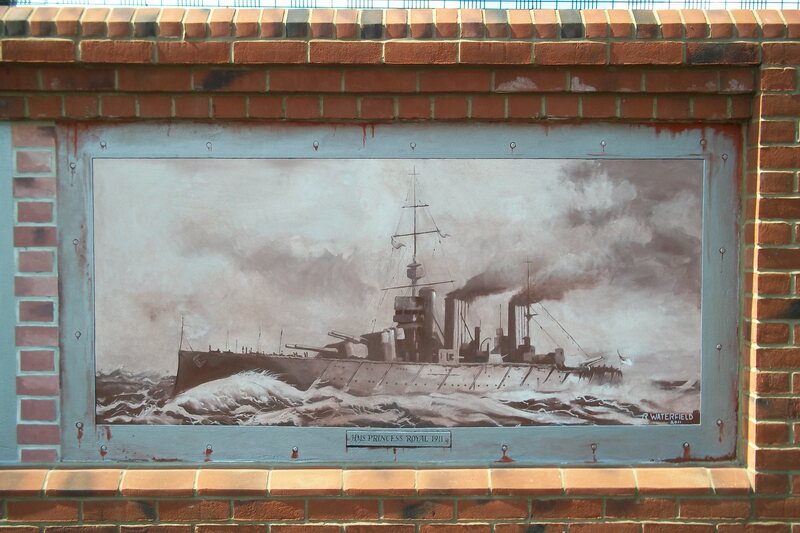 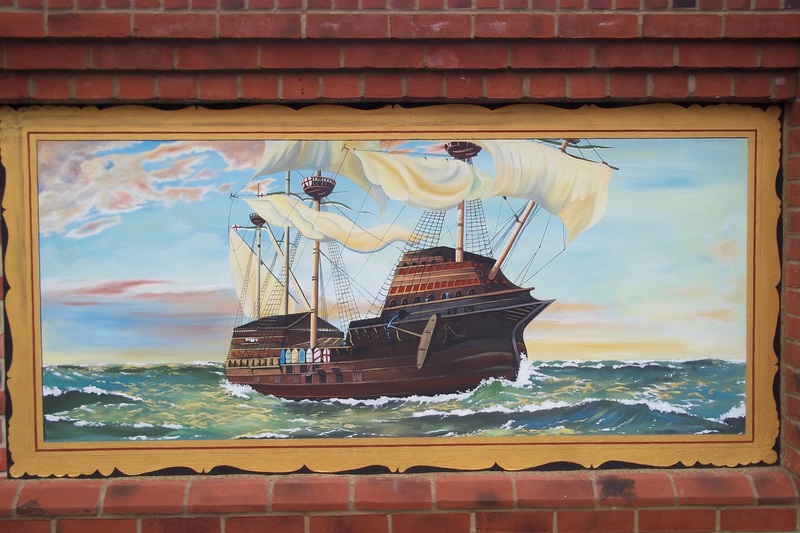 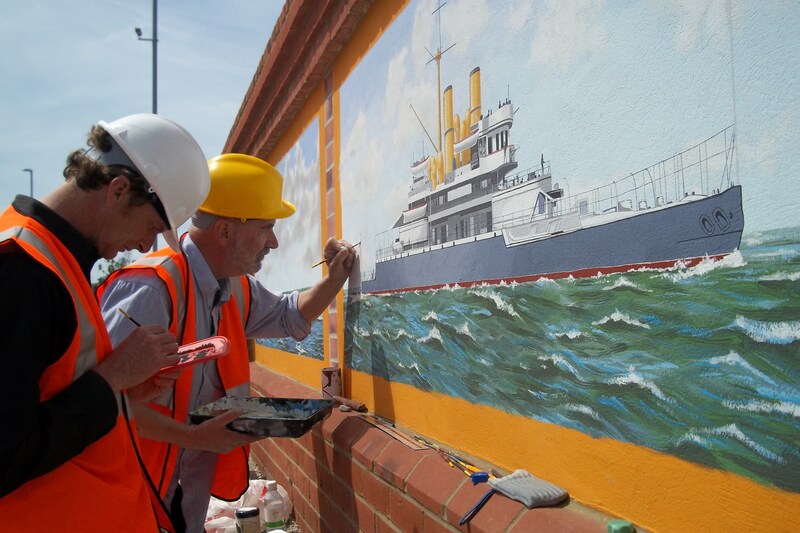 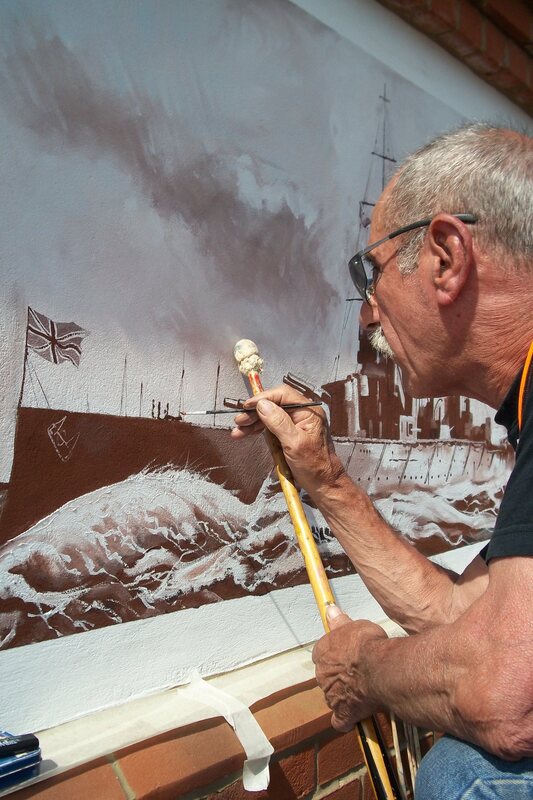 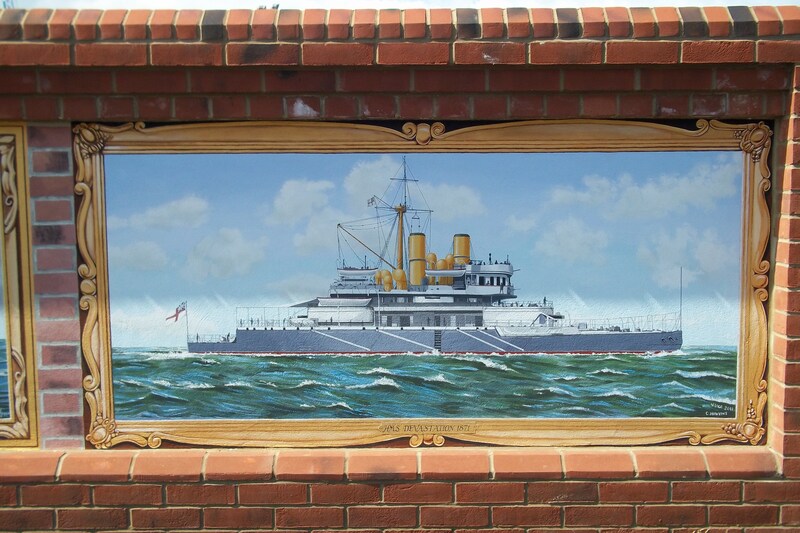 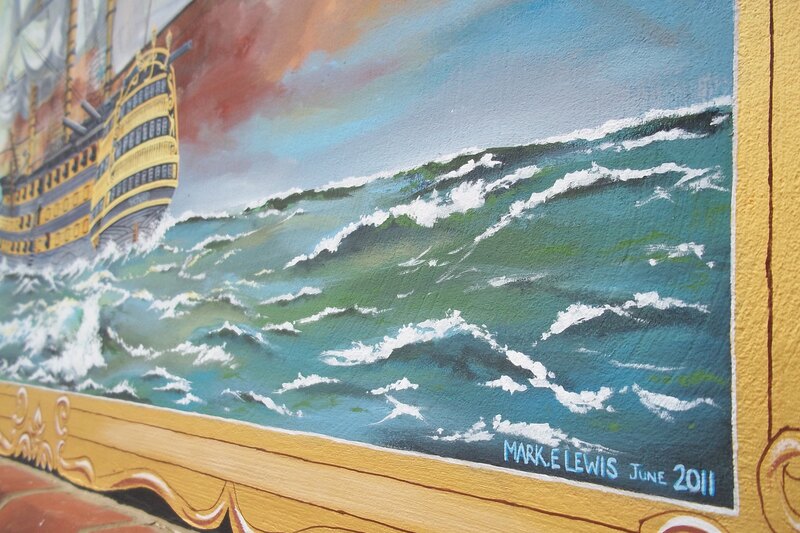 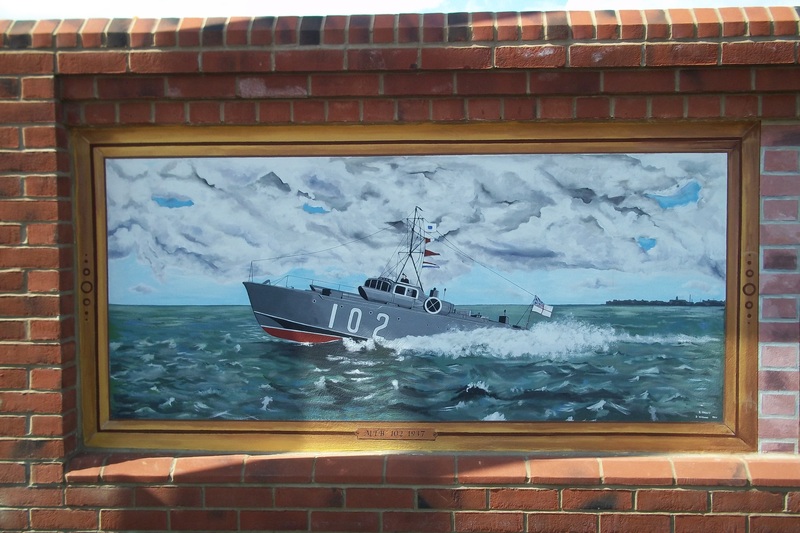 In total we painted 10 x images of a maritime theme painted directly onto five rendered finished wall panels Wall panels are 1.4mx5.8m that will be split to encompass 2 images per panel, 8 x images were supplied via CD from PCC/MOD of a maritime theme. 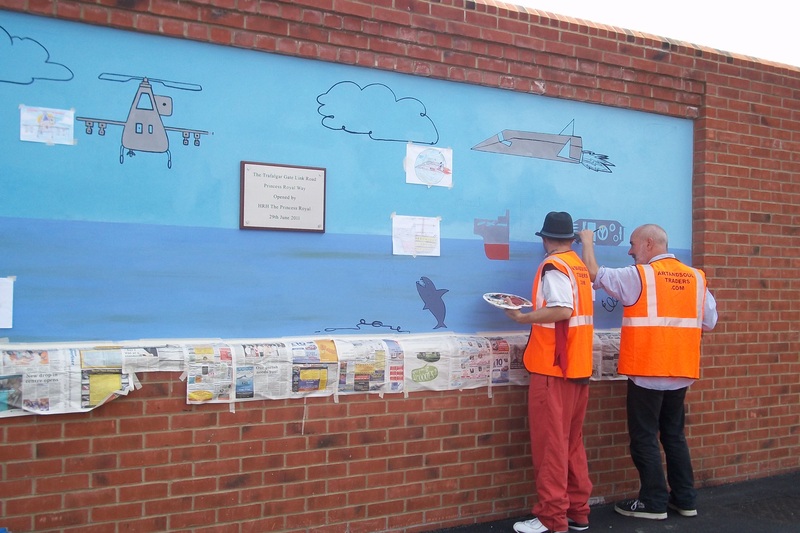 One panel was created with community involvement. 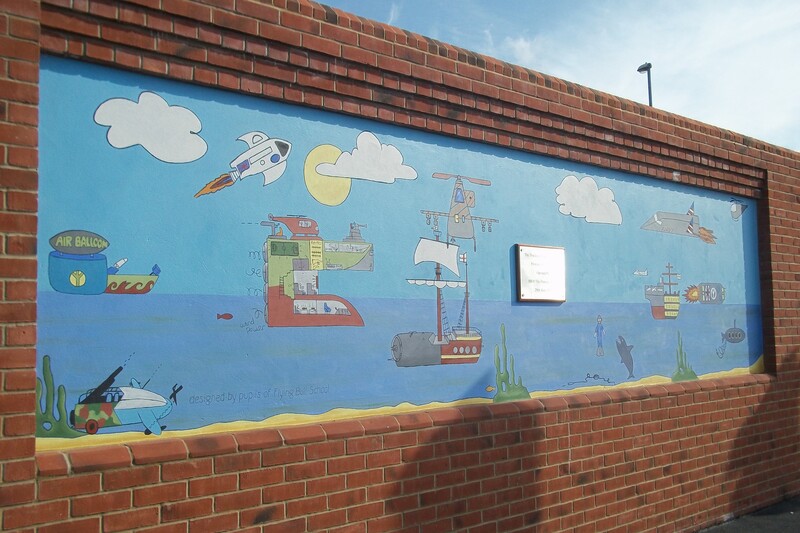 by local schools after consultations from Art & Soul Traders and transferred onto the wall by the artists. 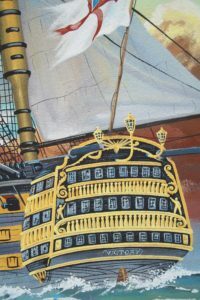 The final paint system all partners agreed on was Keim mineral paints mainly because of the longevity of these natural paints. 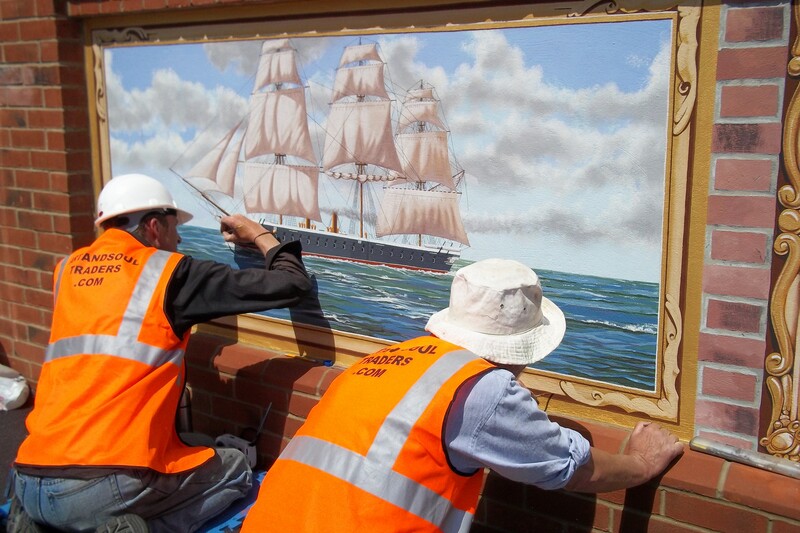 When applied onto new render they have a documented life of over 100 years. 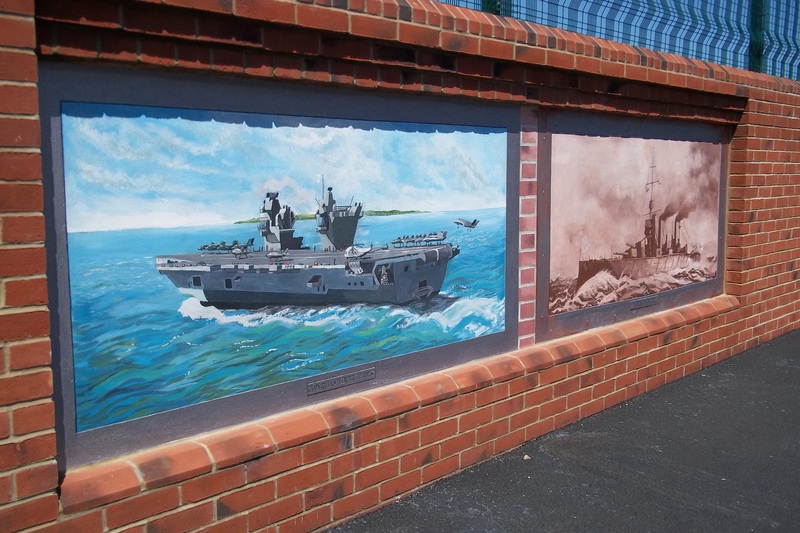 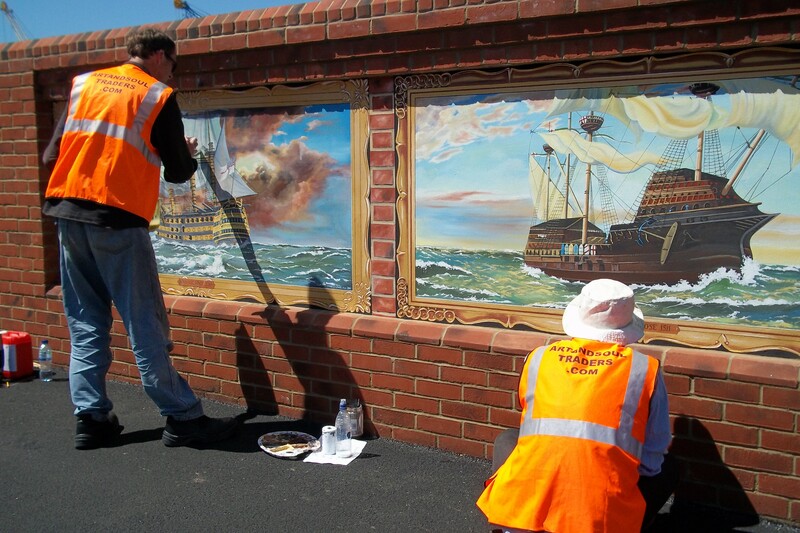 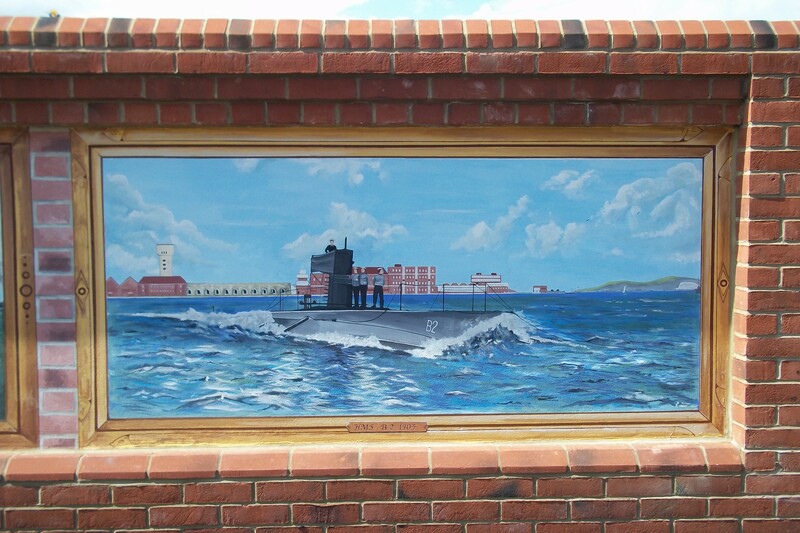 The whole project was a great success with positive feedback not only from the passing staff of the naval base and surrounding businesses but also the general public and tourists alike. 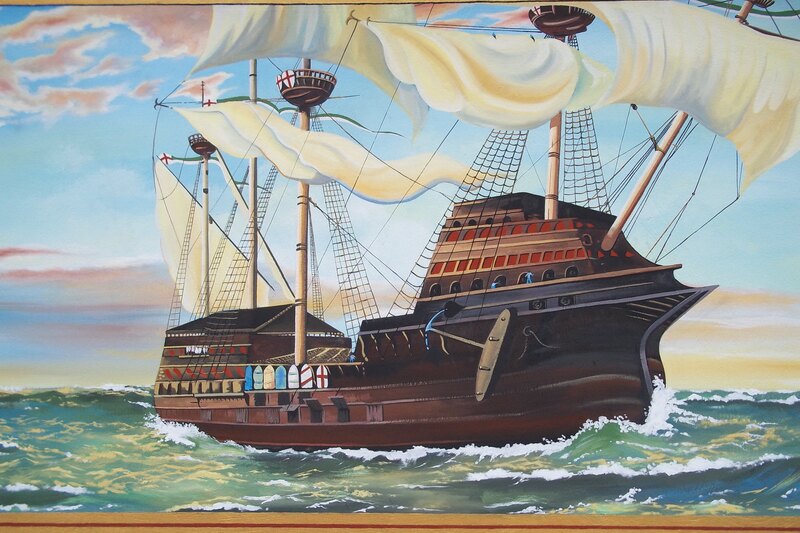 We incorporated the ships ages with gilt frames from the period and divided the panels into two creating the illusion of antique paintings hanging on the wall. 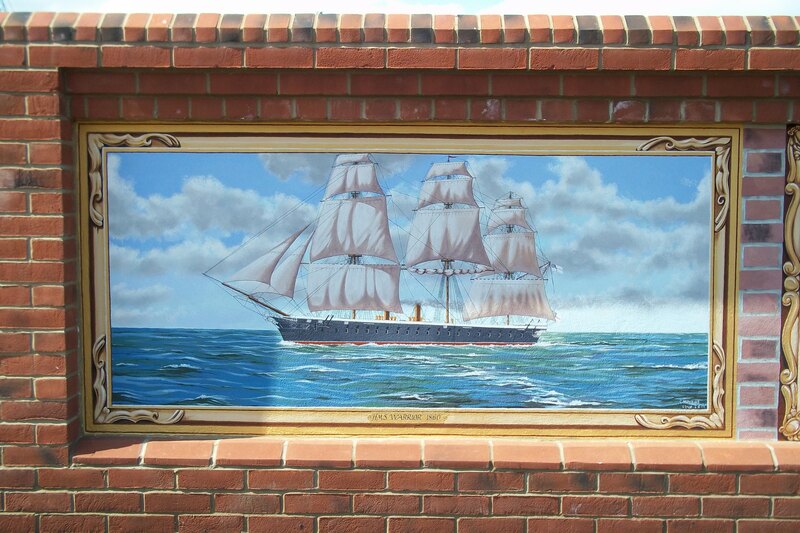 This is emphasised with the trompe l’ oeil painted bricks running down the middle separating the frames. 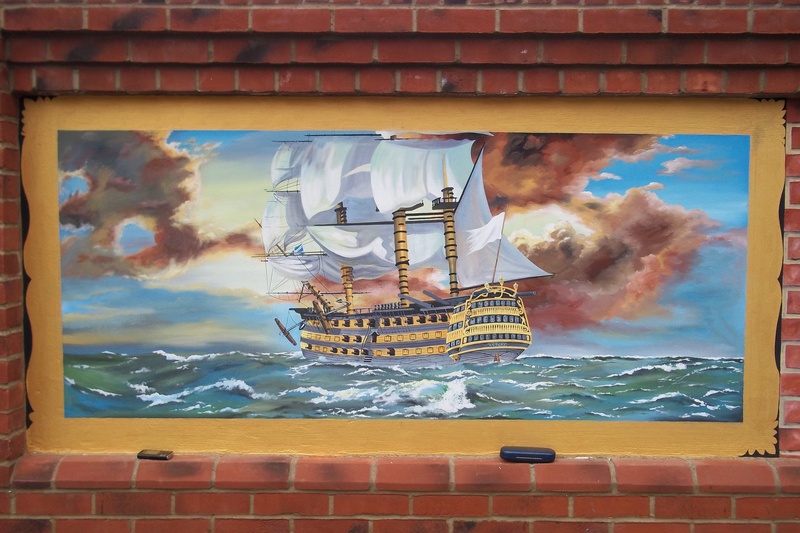 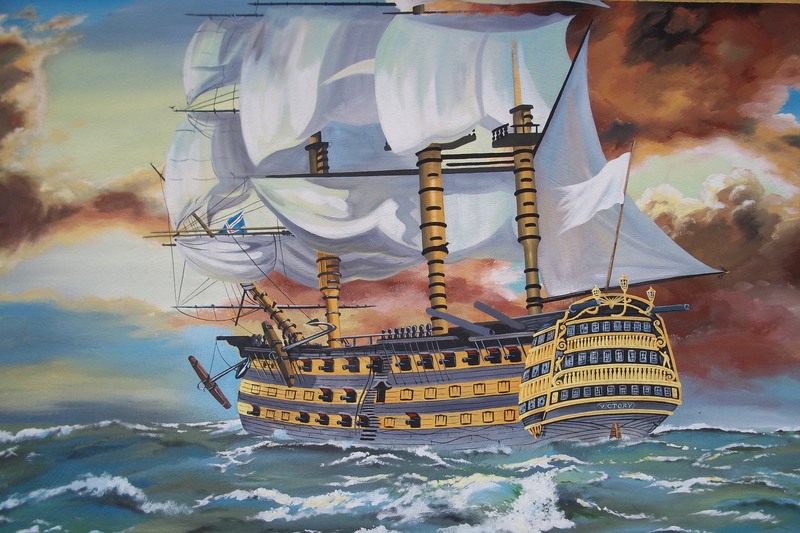 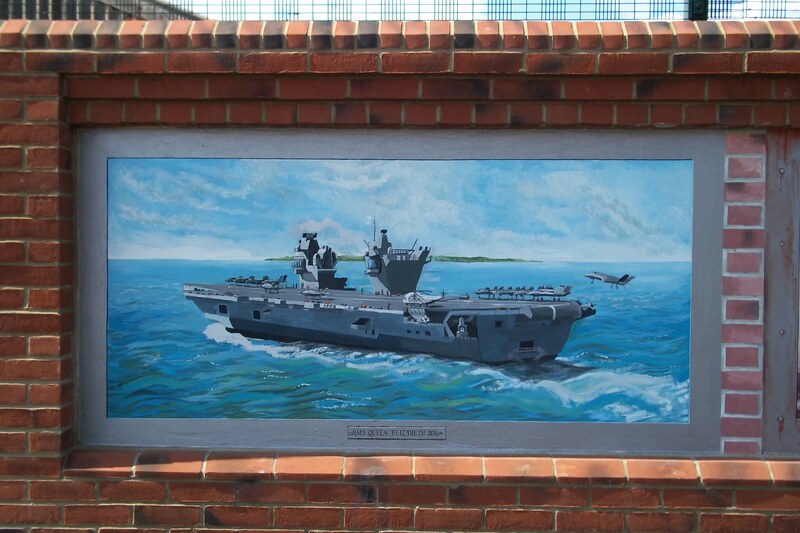 After consultations with myself and Anthony Quintavalle at Buckland Flying Bull School they agreed to set aside 2 lessons for the children to design the final panel on the theme of Navy past-present and future. Sadly as City Arts became involved the designs were not submitted to us before the unveiling date by Princess Ann as planned. 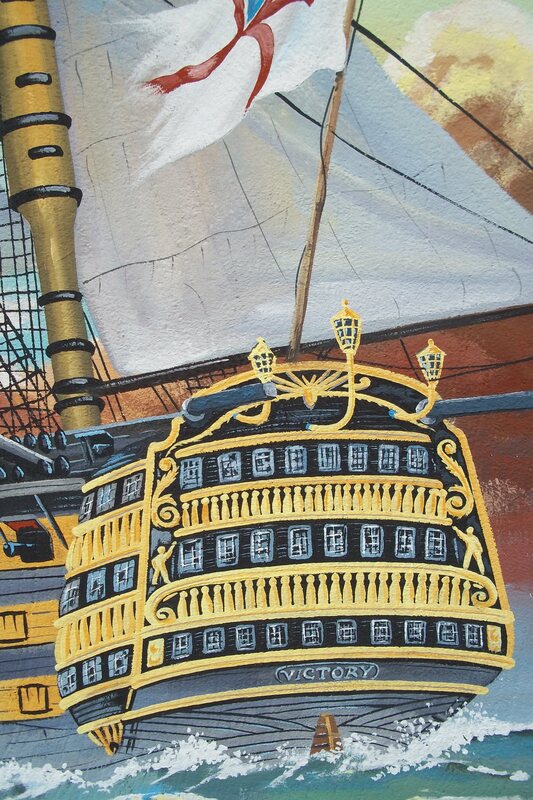 All murals were coated with a specialised Keim paints wax that protects them from not only the elements but also vandalism that may possibly happen in the future. 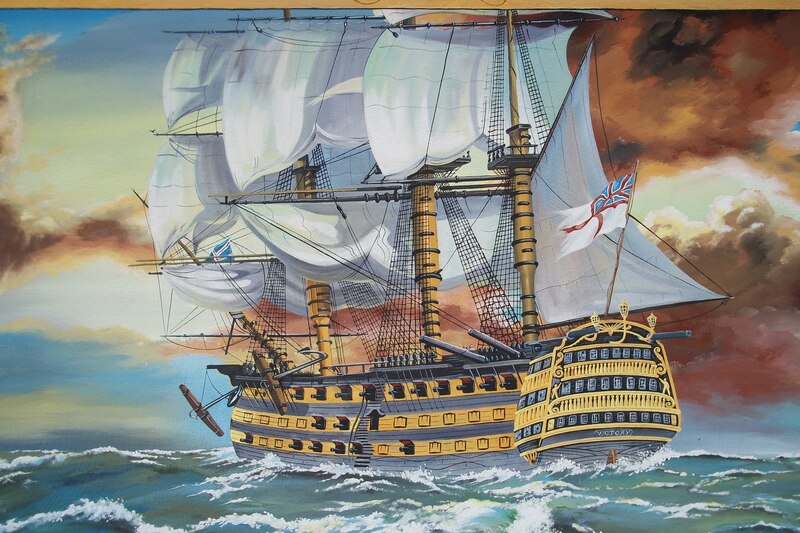 We agreed to undertake the cleaning of this if it happens free of charge for the foreseeable future. 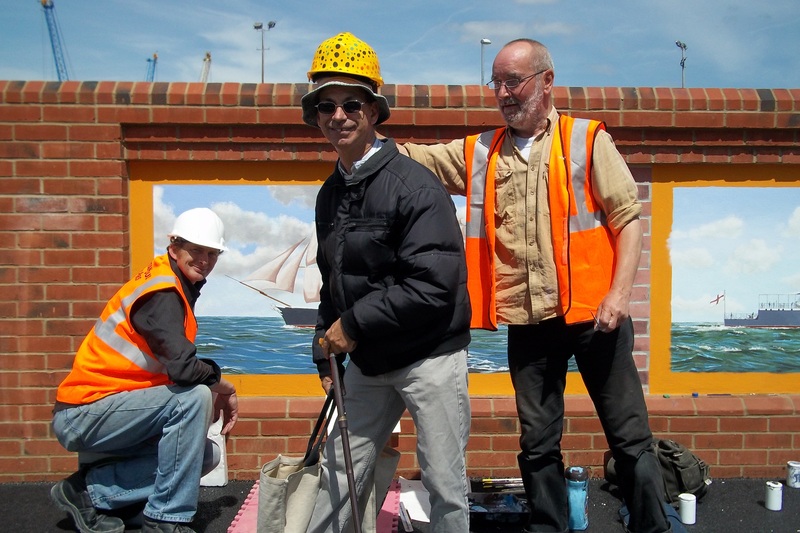 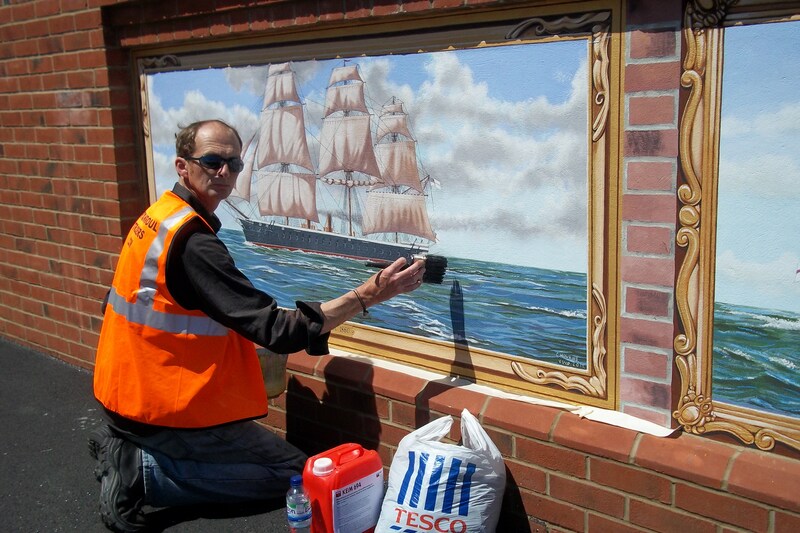 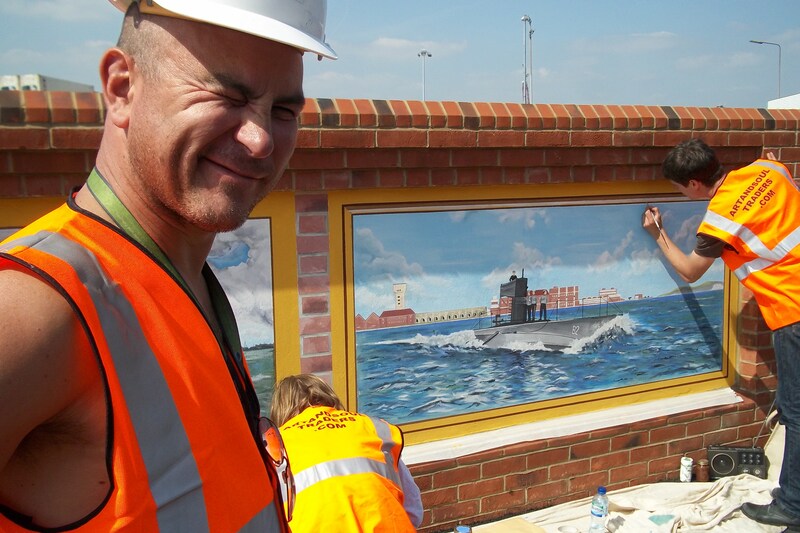 Mark Lewis and his team of artists from the arts and soul traders have worked with and painted many iconic pieces within Portsmouth and now have the images along the new Trafalgar Gate Link Road to add to their successes. 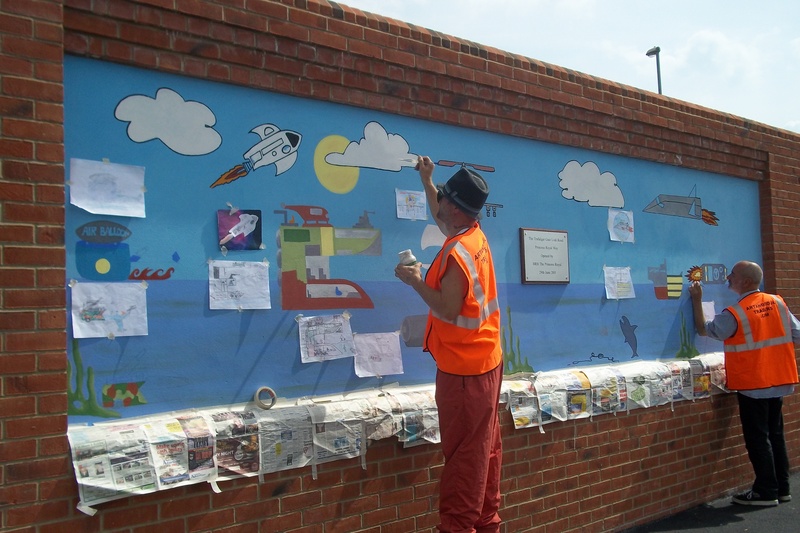 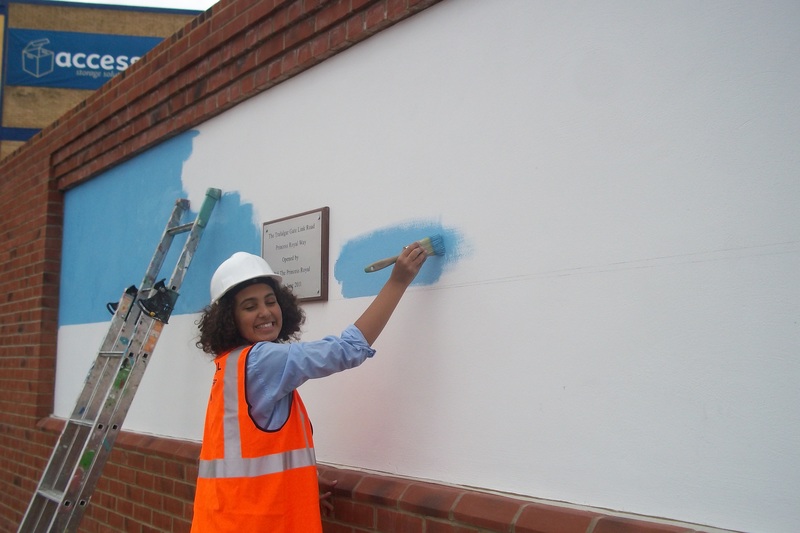 The work that Mark Lewis and his colleagues undertook on the Trafalgar Gate Link Road project was of an extremely high standard, this included not only the artwork on the walls of the new link road but the community involvement and help provided to the local infant school The Flying Bull. 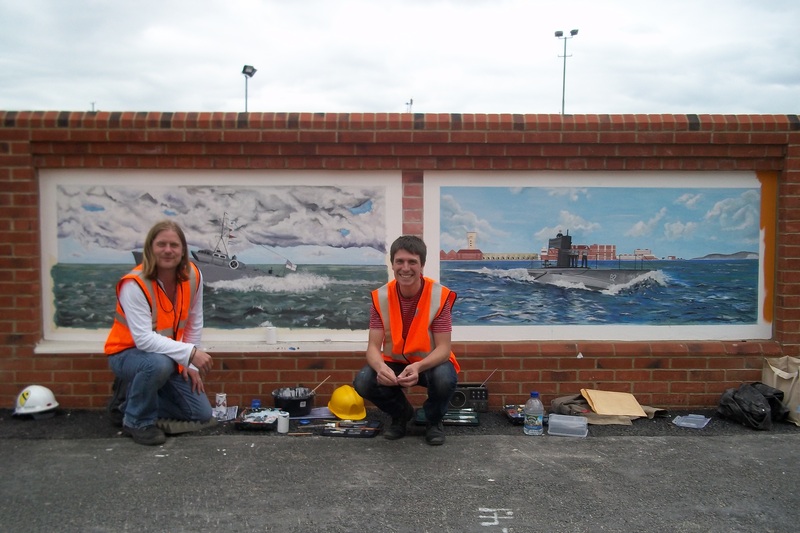 The artists involved with this project were James Waterfield who has a BA Art Hons from Falmouth School of Art and PGCE school teacher with over 25 years experience of painting murals. 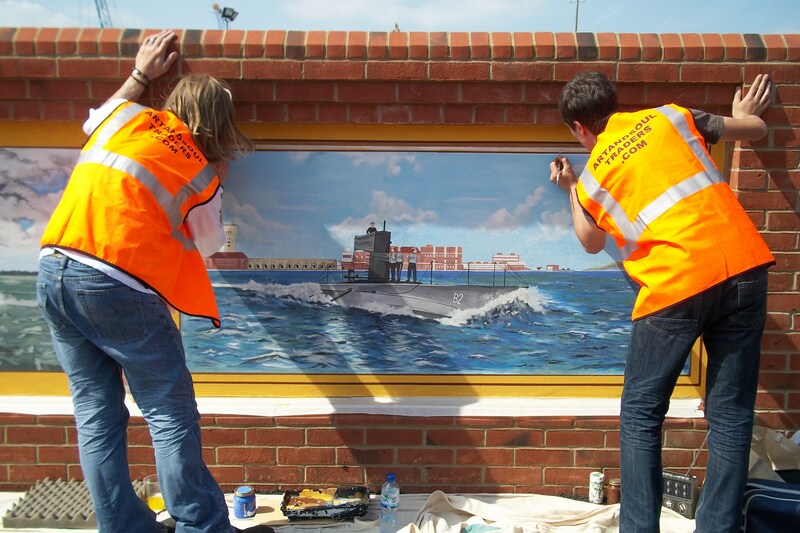 There were two artists from Gosport one was Richard Oakes who has a BA Hons from Portsmouth University and Daniel Williams who is self-taught. Also artist Vice Winstanley and Charlie Howkins from the Isle of Wight who is a specialist on Naval ships and the rigging of them.